Although I love a great moist muffin studded with fruit and nuts for breakfast as much as the next person, when I read how many calories and grams of fat some of them contained I stopped buying them and even stopped making them myself at home. Every once in a while though, I have a craving for a good breakfast muffin and that’s when I pull out this recipe which is both delicious and healthy. I really do prefer to make my muffins at home so I can control both portion size as well as the ingredients I am putting into them. I was really quite surprised when we returned to Umbria this spring and I found All Bran cereal in my local grocery stores as I just cannot imagine Italians eating it. I personally would never choose these cardboard looking nuggets to eat on their own as a cereal, but they work amazingly well in baked goods and are a great source of fiber. As soon as I stumbled across All Bran in my local grocery store last month I bought a box and then made these muffins the following week. I have been using this recipe with many variations for many, many years and it makes a whopping 24 muffins at a time. The great thing about this recipe though, is that you can keep the batter in the refrigerator for up to two weeks and bake 6 muffins at a time if you wished. This is great as it allows you to enjoy fresh baked muffins whenever you choose. Personally though, I’m not that awake first thing in the morning to be baking muffins as soon as I arise, so I usually bake up all 24 muffins at once and then freeze them in packages of 6. I then simply take a package out of the freezer the night before I decide I want them, and I have my muffins ready for me the next morning for breakfast. If you were making these muffins for a special brunch or for guests, you might want to sprinkle the tops of them with a streusel mixture to make them more attractive, but when I am making them for myself and my family I usually keep them simple. Buttermilk is not as readily available here in Umbria although I did bring a can of powdered buttermilk along with me. As a substitute for buttermilk you can also use soured milk, or even milk. Apples are are a good food source of vitamin C which is important for supporting a healthy immune system, forming collagen and enhancing iron absorption and rich in healthy carbohydrates needed for energy. All Bran is very high in dietary fiber. Minimal amount of fat is used and olive oil replaces butter. 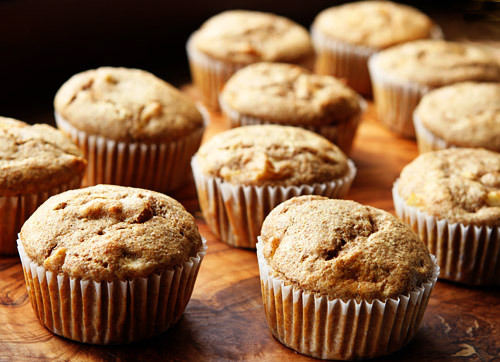 These moist muffins are a good source of dietary fiber! Saute the apples in a frying pan with the olive oil until tender. In a large bowl, combine the cereal, buttermilk and water. Add the eggs, sugar, raisins, and apples and mix well. In a separate bowl, combine the flours, baking soda, cinnamon, and salt. Stir the dry ingredients into the bran mixture just until moistened. Fill medium sized greased or paper lined muffin cups 3/4 full. Bake for about 25 to 30 minutes or until cooked through. Cool 10 minutes before removing the muffins from the tin.